EKONID, the German-Indonesian Chamber of Commerce and Industry, represents the bilateral business interests of its Indonesian and German member companies and institutions in Indonesia. 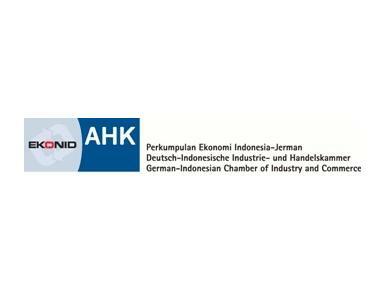 As part of the network of German Chambers Abroad (AHKs), EKONID is officially mandated by the German Federal Government to promote trade and investment between Germany and Indonesia. EKONID’s corporate, institutional and private members are supported through a wide range of network and lobbying activities, especially towards ministries and other government authorities. EKONID understands itself as a responsible corporate citizen of Indonesian society and is active in social, educational and economic development projects. Founded in 1970, EKONID has today established itself as a reliable and competent provider of business services for its members and clients in both Germany and Indonesia. Its areas of expertise cover market entry, trade fair participation, event management, advertising and promotion. The Chamber acts as the official Indonesian representative of the following trade fair organizations: Deutsche Messe AG Hannover, Messe Frankfurt, KölnMesse, Messe Berlin and Messe München.